A sprained ankle is more serious than your regular twisted ankle. Twisted ankles are more common and usually require less down time and a faster healing process. Sprained ankles are more serious and may require more attention to heal properly. 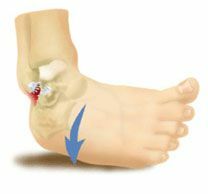 Sprained ankles can signify torn ligaments in the ankle. The Best Way to Tell the Difference Between a Twisted Ankle and a Sprained Ankle is by Seeing a Doctor. However, the pain will help to tell you immediately. Sprained ankles are most often caused by sports injuries when a foot is planted on the ground and the ankle turns and rolls. Depending on the severity, the pain will be immediate. The ankle will usually become swollen and bruised right away and in extreme cases, you may even hear a popping sound. The more serious the sprain, usually the longer the healing time. As with most injuries, you will want to be seen and treated immediately in order to prevent further damage and to expedite the healing process. In the meantime, the RICE method id the best way to start. Rest, Ice, Compression and Elevation. Usually, you will become non weight baring, meaning you cannot put weight on the foot or ankle. Your will need to wear a brace or use crutches altogether until the doctor feels you are ready. In some extreme cases, you will need to have surgery to repair torn ligaments.